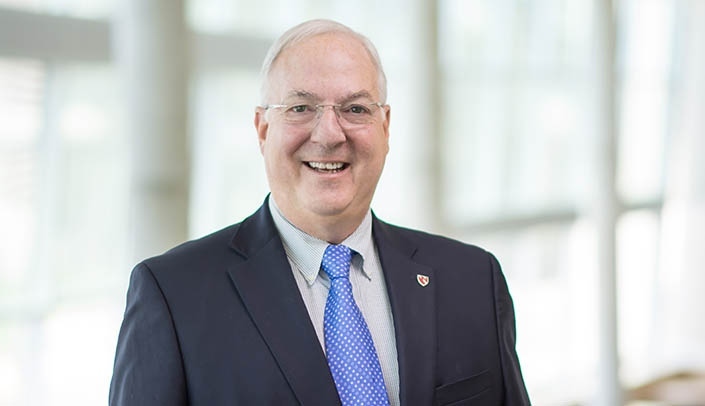 The man who helped spearhead the ascent of UNMC/Nebraska Medicine into an international powerhouse for cancer care and research -- Ken Cowan, M.D., Ph.D. -- will step down as director of the Fred & Pamela Buffett Cancer Center and the Eppley Institute for Research in Cancer at the end of June 2019. Dr. Cowan, who joined the medical center in 1999, will remain as a full-time faculty member and will continue to see patients. "What an incredible run it has been," said UNMC Chancellor Jeffrey P. Gold, M.D. "Dr. Cowan has been a visionary leader who elevated our cancer programs to new heights and was instrumental in building a world-class program. I can't thank Ken enough for everything he has done. "The opening of the Fred & Pamela Buffett Cancer Center in 2017 was an historic moment in the history of our medical center and truly the culminating event in Ken's amazing career. But, this was just one of his many accomplishments. He accomplished so much -- it's a legacy that will never be forgotten. We are thrilled that he will continue to serve on the faculty and provide his expertise in the research laboratory as well as the clinic. "His incredible leadership and strong teamwork has created a very solid trajectory for the future. We are all very grateful." A New York City native, Dr. Cowan came to Omaha after 21 years in the Public Health Service at the National Cancer Institute in Bethesda, Md. For his final 11 years at the NCI, he served as chief of the Medical Breast Cancer Section, Medicine Branch. He was the sixth director of the Eppley Institute, which was founded in 1961. Under Dr. Cowan's direction, all cancer researchers throughout the campus were united into a larger single entity. Originally, this entity was called the UNMC Eppley Cancer Center, and it is now called the Fred & Pamela Buffett Cancer Center. The largest construction project in the history of the University of Nebraska, the $323 million Fred & Pamela Buffett Cancer Center opened last year with former Vice President Joe Biden coming to Omaha for the grand opening ceremony. Under Dr. Cowan's leadership, the Fred & Pamela Buffett Cancer Center moved from a basic laboratory cancer center to become one of only 70 cancer centers to earn the National Cancer Institute (NCI) designation, and the only NCI-designated cancer center in Nebraska. Over the past two decades, more than 200 faculty have been recruited to the Fred & Pamela Buffett Cancer Center and research funding has increased more than three-fold from $19 million in 1999 to more than $60 million in 2018. Dr. Cowan said he will never forget his nearly 20 years as director. "My wife (Alison Freifeld, M.D., director of oncology infectious diseases at UNMC/Nebraska Medicine) and I have fallen in love with Omaha and the state of Nebraska. We had no idea what we were getting into," he said. "To see the philanthropic support that manifested itself when we were building the new cancer center was just unbelievable. "When we travel around the state, we get to see first-hand how important the cancer center is to the citizens of Nebraska. It is a source of pride for the entire state. "The cancer center team is second to none. The clinical care and research that goes on in the Fred & Pamela Buffett Cancer Center is world-class in every sense of the word. We have made a difference in people's lives. That's the ultimate compliment for any cancer center." Chancellor Gold indicated that a national search for the next director of the Fred & Pamela Buffett Cancer Center will be organized rapidly to ensure a smooth transition. Thanks to you for your participation in the Sidney Nebraska's Night of Hope Walk for Cancer. You enhance the mission of our community to contribute to cancer research. Your presence and knowledge are greatly appreciated. Thank you, Dr. Cowan, for the extraordinary work you have done to make Nebraska shine! We are happy you will still be here to share your experience and insight as an expert in breast cancer! Thanks for what you do to save and improve the lives of patients. Increasing cancer research funding from $19 million in 1999 to more than $60 million today. Establishing clinical trial partnerships with hospitals in Grand Island, Hastings, North Platte and Scottsbluff. Recruiting more than 200 new cancer center members. Being one of the leading breast cancer experts in the area and helping hundreds of people in their battle with the disease. Making the healing arts an important element of the cancer center highlighted by the Chihuly Sanctuary. Being a member of the National Cancer Advisory Board (2002-2008). Making the Fred & Pamela Buffett Cancer Center a member of the Big Ten Cancer Research Consortium. Making the Cattlemen's Ball of Nebraska a signature fundraising event for the cancer center. Over the past 21 years, the ball has raised more than $15.8 million for cancer research. Establishing the Ambassador of Hope Award to raise cancer awareness by recognizing well-known individuals with a cancer connection. Awardees include Condoleezza Rice, Sam Donaldson, Robin Roberts and Gen. H. Norman Schwarzkopf. Having the cancer center featured on "CBS Sunday Morning" in 2017 as part of an interview with Warren Buffett. Receiving the 2018 Lifesaver Award from the Nebraska Coalition for Lifesaving Cures. Receiving the 2015 Harlan J. Noddle Award for Distinguished Development Service from the University of Nebraska Foundation.